Once the Thanksgiving feast is over, the fun continues with leftovers. The downside of not hosting the Thanksgiving feast is the dearth of leftovers, unless you plan ahead, which we did. For the past couple of years, Howard has been experimenting with sous-vide cooking. For a few years, he used a water immersion circulation that he rigged from old laboratory parts he purchased on eBay, but he recently upgraded to a brand new, more professionally-assembled one. It seemed natural to see what he could do with a turkey. We don’t have a container big enough to fully immerse a whole turkey, so, the first step was to break the turkey down into parts: breasts, thighs, drumsticks, wings, and miscellaneous bones. The bones went straight into the freezer for stock later this winter. 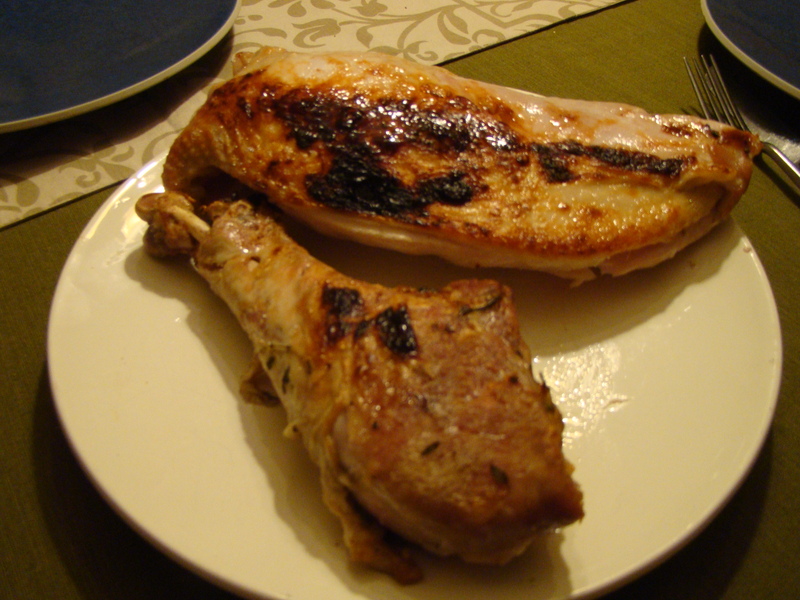 So did one of the breasts, as you can only eat so many leftovers…. With the turkey in multiple pieces, Howard tried a few different preparations. He brined the deboned breasts and thighs for 22 hours in a classic sugar-salt brine with herbs (sage, thyme, and garlic) and spices (whole allspice, cloves, peppercorns, and coriander seeds) added. Then, he vacuumed sealed the meat (one bag per piece) along with a few tablespoons of duck fat in each bag and cooked in an immersion bath for 4 hours at 140F. 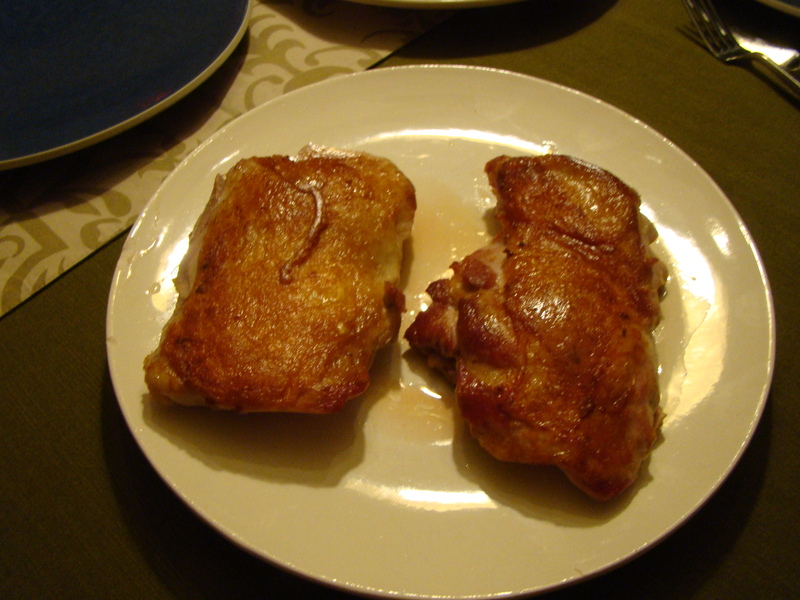 To finish for serving, Howard broiled the breast and pan-fried the thighs to crisp up and brown the skin. 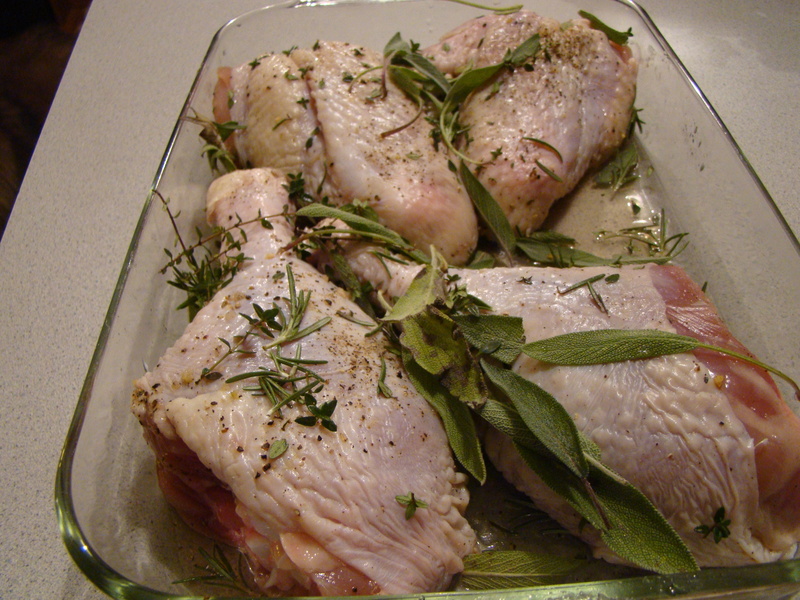 The drumsticks and wings were rubbed with salt mixed with sage, rosemary, and thyme and left to air dry in the fridge for 24 hours. These parts were vacuum-sealed in bags with sage, thyme, and garlic and a couple tablespoons of duck fat. To transform into confit, these bags were cooked at 180F for 11 hours. To brown the skin, these were broiled before serving. To make the most of the turkey, we also made a simple turkey liver pâté from its liver. The cooked liver (which was simmered in water), sauteed onion, and a hard-boiled egg were pulsed in the food processor until almost smooth. We enjoyed a post-Thanksgiving dinner with turkey served 3 ways (four if you count the pate served as an appetizer) along with our favorite sides (mashed potatoes, chestnut stuffing, and roasted Brussels sprouts). 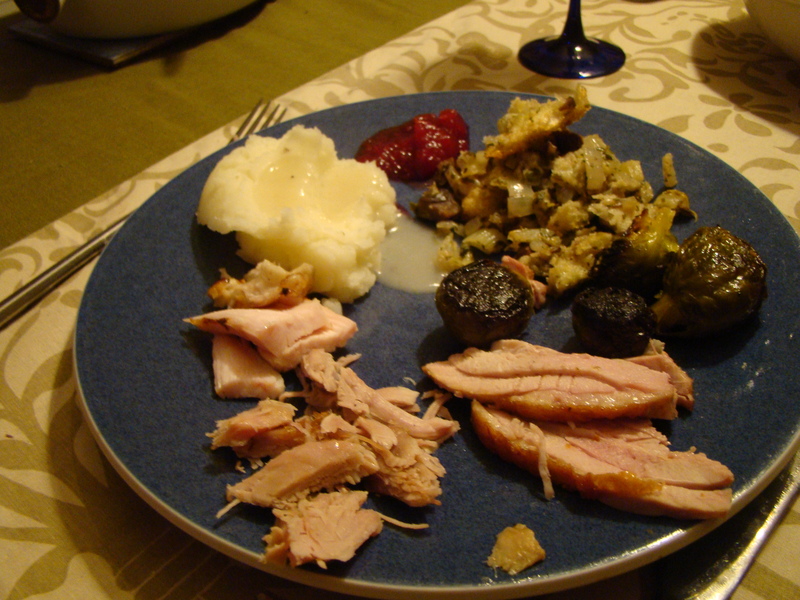 Posted on 26 November 2012, in Autumn, Thanksgiving and tagged turkey, turkey leftovers. Bookmark the permalink. 2 Comments. Turkey and noodles with the peanut sauce sounds delicious. Loving the baked eggs in stuffing cups – yum!